Recently I was teaching a group of young adults the Ten Scrolls of Success, from Og Mandino’s The Greatest Salesman in the World. For this one hour event, I did something unusual. I didn’t ask for cell phone devices to be put on silent, I asked them to have a one hour fast with me from the electronic media world. 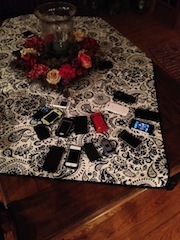 They placed their phones voluntarily on a table, while we taught and discussed the Ten Scrolls. What do we show when we place our electronic devices down for a moment? We show respect for the others who are speaking and teaching. We have real conversations; using actual words and dialogue. We prove that we are not addicted to the buzz, or tweet, or vibrate of the incoming message—IT WILL WAIT. We are “present” for conversation, and we show to the person or group that what is going on at hand is not subordinate to our own personal messaging. We can offer more because we understand more—-we are not distracted as we contemplate things of importance. “I have cheated myself for too long. I have given lip service to those who have employed me and begrudged every hour of what I considered was boring toil. Work, to me, was the sorry price I had to pay to exist because the Gods had not seen fit at my birth, to place gold in my hands and a crown on my head. What a fool I have been. Now I know that the fruit derived from labor is the sweetest of all pleasures and while genius may commence great works, only labor will complete them. My eyes have finally been opened through these scrolls. The evening with the young adults was a game changer—-very remarkable to look into the faces of those being taught, rather than see them constantly reaching for the buzzing electronic device and putting their head down with thumbs a blazing. The audience actually appreciated it as much as I did, and together we discovered a great lesson; we are our best when not distracted. Social media is here to stay, but we can STILL control whether it is a tool for good, or if it actually controls us. THINK of the negative impact you create when you are constantly reaching for that world of instantaneous response and connection. Rise above the electronic world to engage in the work at hand so that you might be your BEST.